I have been hoping for a glimpse of a bluebird for years now. I put up a bluebird house years ago but some sort of swallow immediately nested in it. No bluebird ever even flew by to check it out. Once I thought I had a bluebird in my sights but it was a beautiful indigo bunting. Last week as I walked towards my front door I noticed a flutter of activity by what I thought was a flock of robins. But their feathers were a beautiful royal blue. I got closer and they scattered. Later, looking from the inside out I saw that there were eight or nine birds on my front stoop. I have a sap bucket right next to the door filled with greens, red stem dogwood branches, berried ilex and juniper branches. There is also a large basket filled with extra ilex branches, loaded with bright red berries, that I never got around to using. 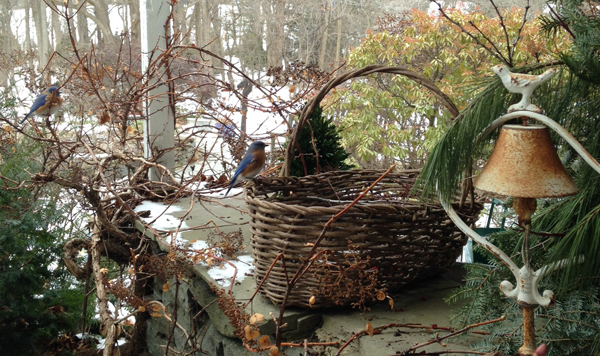 And there they all sat; nine eastern bluebirds happily feasting on the ilex berries. Can you spot the four bluebirds in the tree? It turns out that a flock of these birds inhabited one of our western fields all summer. In warmer months bluebirds feed on insects, particularly caterpillars, beetles, grasshoppers, crickets and spiders all of which are plentiful in our growing fields. Come winter their diet turns to fruit including ilex berries, juniper berries, dogwood berries, hackberries and honeysuckle. They are not attracted to the seed typically put out in bird feeders. They and other birds have eaten just about every last berry on the bushes in our fields. Somehow this small flock of bluebirds discovered the stems on my front stoop and I got my very up close and personal siting. Some more fun facts I learned about bluebirds is that on cold winter nights groups of them will huddle together in hollow trees. We have plenty of them on the property. They will also huddle together in roosting boxes. I don’t have one of those. The Michigan Bluebird Society has a good website. 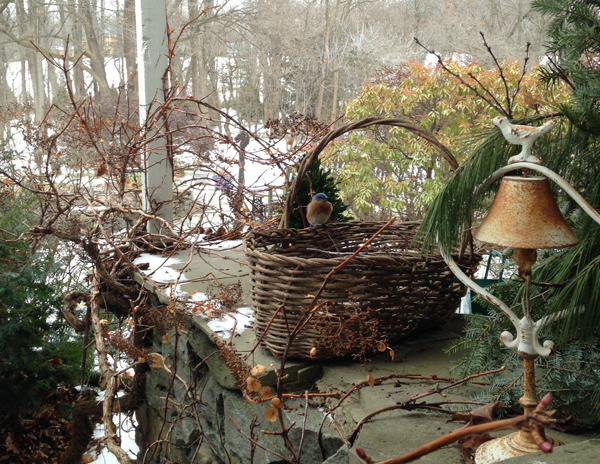 They offer suggestions and recipes for feeding bluebirds in winter. (Michiganbluebirds.org). 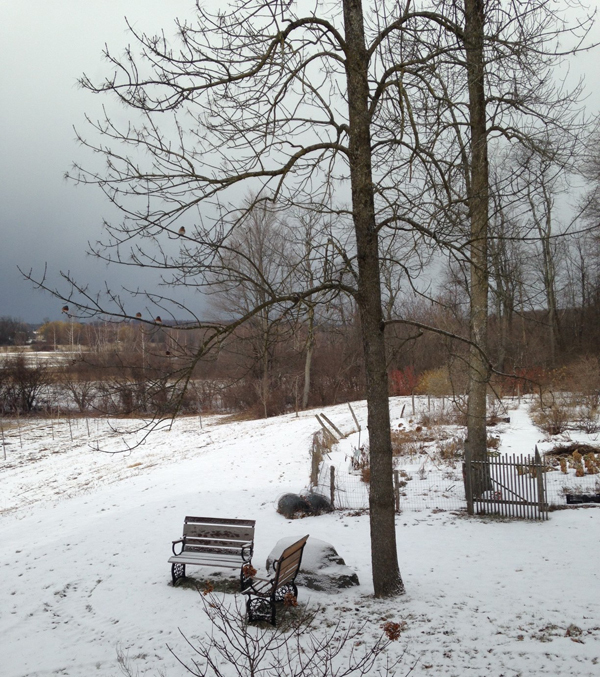 While it would be fun to continue watching the bluebirds I am hesitant to put out food that would most certainly attract other residents like raccoons, skunks, and all those bushy-tailed squirrels.